State-controlled Norwegian oil company StatoilHydro has decided to build the world’s first full scale floating wind turbine, Hywind, and test it over a two-year period offshore Karmøy. StatoilHydro has developed HyWind based on floating concrete constructions familiar from North Sea oil installations. 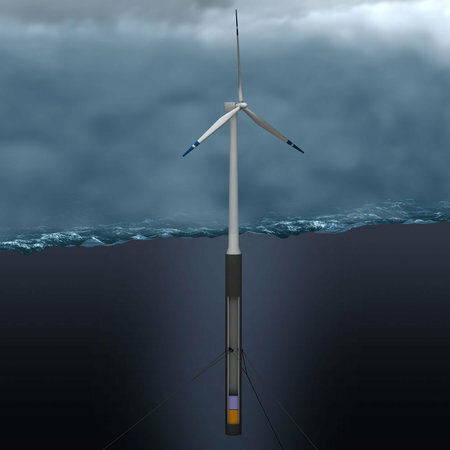 The rotor blades on the floating wind turbine will have a diameter of 80 metres, and the nacelle will tower some 65 metres above the sea surface. The floatation element will have a draft of some 100 metres below the sea surface, and will be moored to the seabed using three anchor points. The wind turbine can be located in waters with depths ranging from 120 to 700 metres. The pilot project will be assembled in Åmøyfjorden near Stavanger and is to be located some 10 kilometres offshore Karmøy in the county of Rogaland. The wind turbine itself is to be built by Siemens. Technip will build the floatation element and have responsibility for the installation offshore. Nexans will lay cables to shore, and Haugaland Kraft will be responsible for the landfall.